Handmade from solid oak, this unique wooden, rustic but stylish waney edged board is a wedding table plan that is sure to wow! Made from solid oak, this wedding table plan is a fabulous and rustic, country style wedding piece. With the oak sourced from sustainable forests, you can be sure the product is ethically and responsibly produced whilst enjoying its natural beauty. 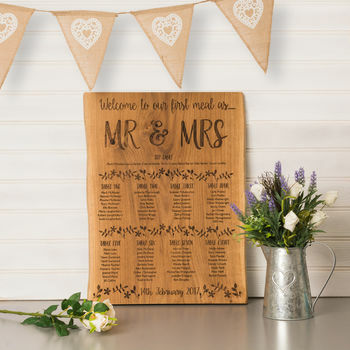 The rustic wedding table plan will be working hard long after everyone has found their seats, the solid piece of oak can be crafted into a fabulous piece of furniture as a table or bench top after the wedding. This will then serve as a beautiful reminder of your happy day. The table plan is available in different sizes to accommodate all wedding party numbers. Please ensure you select the appropriate sized board from the options available. All details for the table plan should be with us as soon as possible after the order is placed, where ever possible but we advise as a minimum we need two weeks notice to achieve delivery. To send us over the names and table details please use the order enquiry function (contact the seller). We will send you back an electronic drawing to show how the product will look and once you have approved this we will put your piece into production. Be sure to check all spellings and let us know at this point if you would like anything amending. Once the details have been approved and the item is produced it is not possible to make any changes. The plan is made from solid oak, the board is oiled. PLEASE NOTE, once you have placed your order and we have drawn up the artwork, we will send you an attachment so you can see the proof of your table plan before we engrave the oak board. We need you to confirm back to us that you are happy with the layout and that names and spellings are correct before we can make up your bespoke product. The board will vary in length according to the number of tables required. There may also be some natural variation in the width of the board - increasing and decreasing along the contours.